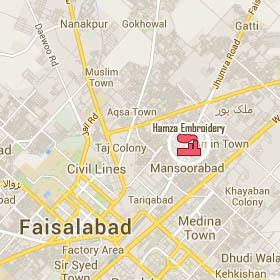 We are the Large Manufacturers Exporter of Embroided Fabric in Pakistan. We work in Valuadded Embroided Fashion Assesories, our products are Embroided Laces on Cotton / poleyster / Silk Fabric in 1? inches upto 24? inches on bright shine colors. We also make cluny (torcon) lace, Shiffili lace, Chemical lace in more than 100colors & in multy colors. Childrens are our hope of future so we make fine quality embroided garments for them in which we use Embroided Collars / Laces and embroided Fabric. We are specialize in Embroided One piece (no joint) 110? inches Bedsheets / Quilt cover / Bed spread & Pillow cases withfull of bright colors, Also embroided lace frills for Pillow, Bed Sheets, Curtains and Table cover etc. We also Export 95?inches valvet embroided Curtains and sofa Embroided Jacquard Fabric. We sell raw / finished Embroided Fabric Cotton 100% Polyester 65*35 45?inches upto 96?inches in printed or dyed. We can do our Embroidery work on man made leather (PVC Quoted fabrics) , Silk, Polyester, Cotton, Nylon, shafoon and Valvet Fabrics.